This lovely little blue cotton blend batiste baby dress is hand embroidered in the Philippines. 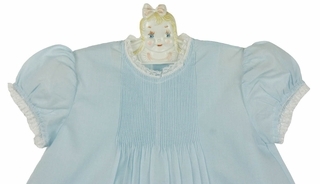 It features a beautiful yoke with rows of tiny pintucks. 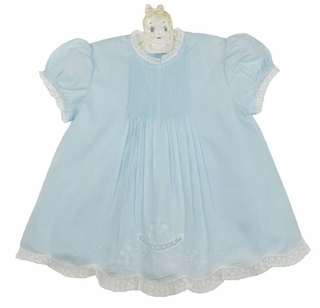 This elegant little dress has a lace edged round neckline and short puffed sleeves trimmed with lace. A row of scalloped lace below an embroidered floral spray with lace insertion finishes the dress, which closes in the back with two small buttons. The matching slip can be worn alone as a slip dress in the summer. The perfect take home dress for bringing your new baby girl home from the hospital, first portrait dress or special occasion dress for your little angel! Note: This beautiful little dress is also available in yellow. See below.